However much we might love our homes in beautiful and historical Devon and Plymouth, sometimes we long for a change – and renovating our staircase balustrade with, say, metal rather than wooden spindles, then adding a stylish new banister, might be all it takes. The range of colours and styles in which we stock our stair parts here at Pear Stairs will amaze you. Our finely-turned newel posts, finials and wooden spindles, for example, are produced in American White Oak, American White Ash; Hemlock; various pines and the beautiful hardwood Sapele (responsibly sourced, of course). Metal spindles, meanwhile, can be finished in striking matte black or cool stainless steel, for a light, contemporary look in your Plymouth or Devon home. 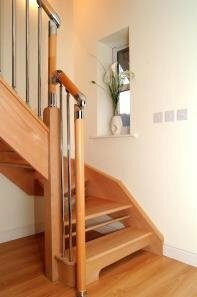 A polished banister in natural wood completes the look for a fine modern balustrade. All sorts of different architectural and design styles are available to go with your Devon staircase – just leaf through the pages on our website to get a flavour. Of course, there are the classics such as Georgian or Colonial Fluted wooden spindles, with their elegant curves. But you can also mix things up a little and achieve a stunning effect. Have a look at our examples of staircases with alternating Oxford and Twist spindles; or the sleek black Madison, alternated with Edisto metal spindles. Putting together your ideas for re-modelling the staircase of your Devon or Plymouth home couldn’t be easier with our step-by-step guide to measuring up and designing your staircase, here on our website. 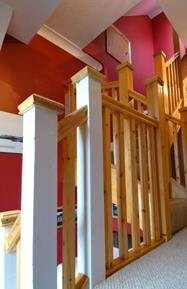 All aspects, from designing the balustrade to fitting the banister, are covered. If you prefer, though, we are happy to handle all the technical aspects for you. 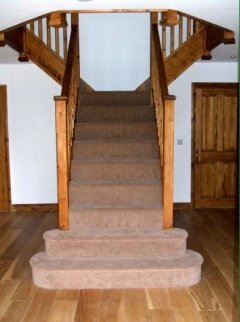 We have over a century of expertise in stair-making, and our friendly and experienced staff will be only too happy to help you. Our parts are delivered (carefully packaged) to Devon via courier within 7-10 days of receiving your order. So, sit back and scroll through our beautiful, quality (and excellent value) range. Whether your home is a traditional Devon cottage, or a chic Plymouth harbour apartment, we have wooden and metal spindles, banisters and balustrades which will treat your place to a real makeover.